This week, the U.S. Senate confirmed former Kansas Governor Sam Brownback — a well-known anti-LGBTQ apologist — as U.S. Ambassador At Large for International Religious Freedom. But Sam Brownback is hardly the only anti-LGBTQ nominee or appointment by the Trump Administration. In fact, an annual GLAAD report recently recorded its first-ever decrease in LGBTQ acceptance – and a likely contributing factor was the continued anti-LGBTQ rhetoric coming from this administration. “Trump ran for president saying he would be a champion for the LGBTQ community, but time and time again he has attacked and demeaned our community and empowered others who do so. 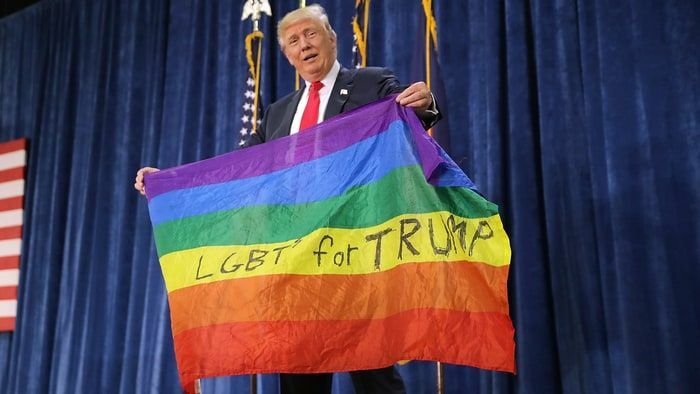 By appointing anti-LGBTQ officials to administration positions and lifetime appointments to our federal court system, Trump has set up an institutional shift that will continue to dehumanize LGBTQ Americans and roll back our rights for years to come,” said DNC LGBTQ Media Director Lucas Acosta. Green’s nomination was ultimately withdrawn. Higbie was forced to resign in disgrace after these comments, among others, were made public. Clovis ultimately withdrew his nomination. Kacsmaryk’s nomination is currently pending. HRC: Nielson has a long track record of hostility and discrimination towards the LGBTQ community. He has stated that being gay is a choice, argued in favor of Prop 8 and abusive conversion therapy techniques, and had the audacity to claim a gay judge could not be impartial in a ruling involving LGBTQ rights. Nielson is unfit to serve on the federal bench, and the Senate Judiciary Committee should reject his nomination. Nielson’s nomination is currently pending.